The dress is inspired by renaissance style but created with fresh modern look. This is only one a kind (OOAK) model. The upper motive is striped tartan of violet-pink colors with gold shining accents, decorated by lace and braid edging. The petticoat is soft cotton-silk material with lace decoration embroidered with beads. There is also beaded neckline of bodice. The dress is inspired by renaissance style but created with fresh modern look. This is only one a kind (OOAK) model. The upper motive is striped tartan of violet-pink colors with gold shining accents, decorated by lace and braid edging. The petticoat is soft cotton-silk material with lace decoration embroidered with beads. There is also beaded neckline of bodice. All inner seams are flat or hidden. Both parts of dress are lined in upper part and had precise fastening with buttons and hooks. The dress is completed with a styled hat with pearls and laced veil. The hat has long ribbons to fix the hair. Enjoy nice contact and look during wearing of the dress, stretch and wear gently. This is product of high-quality work out. 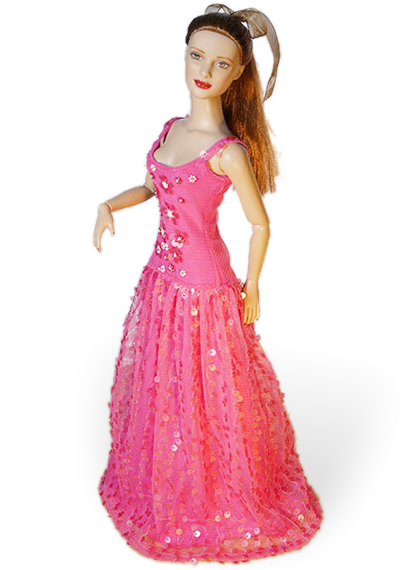 The line of dress is exactly fit for 16inch fashion doll with Tonner Tyler body. It is also suitable for other 16inch fashion dolls. The sleeve is narrow for the circuit hand only 5 cm. Only two-part dress and hat are included.